Ex-lib with all the markings. Covers detached. Text block split. Not what I would call collectible. But then I collect books formerly owned by the person who donated this very book to the library. And she was not the original owner. The inscriptions written and the bookplates pasted on its pages speak volumes about this book's history of ownership. 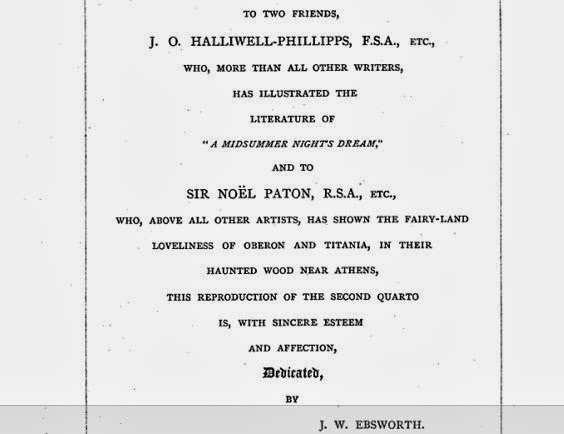 J. O. Halliwell-Phillipps (1820-1889), the author of this book, was the Shakespeare expert of his time, writing over five hundred books and articles about Shakespeare. This book, The Visits of Shakespeare's Company of Actors to the Provincial Cities and Towns of England, was years in the making. For parts of twenty summers, Halliwell-Phillipps toured England, searching the corporate records of seventy cities and towns for notices of visits of Shakespeare's Company of Actors. 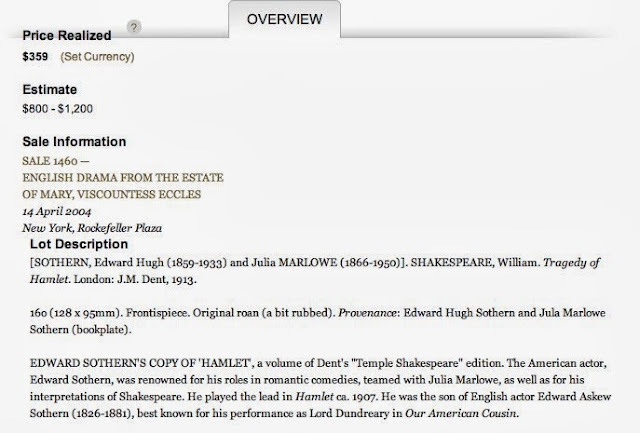 In the preface to the book, he notes that Shakespeare was not the company's manager. Halliwell-Phillipps merely used the term, "Shakespeare's Company of Actors," to identify the company of actors to which William Shakespeare belonged. The book itself was printed "for Private Circulation and for Presents only," a statement which could be unique in the book world. I could find no other book with that statement printed on its title page. Another book by Halliwell-Phillipps, printed in London the same year, however, contains the statement, "For Special Circulation and for Presents only," on its title page. I don't know how many copies of The Visits of Shakespeare's Company of Actors to the Provincial Cities and Towns of England were printed in 1887, but there are currently three copies for sale on the web, two of which are listed at reasonable prices. (Update: Feb 16, 2014. Maybe I don't realize how popular my blog is; all three 1887 copies have been sold and numerous pods are now listed on abebooks). If Halliwell-Phillipps was the resident Shakespeare expert of his time, J. W. Ebsworth was the authority on ballads. He edited both the Bagford Ballads and the Roxburghe Ballads for the Ballad Society, and edited several ballads and plays for the New Shakspere Society, both societies of which he was a member. 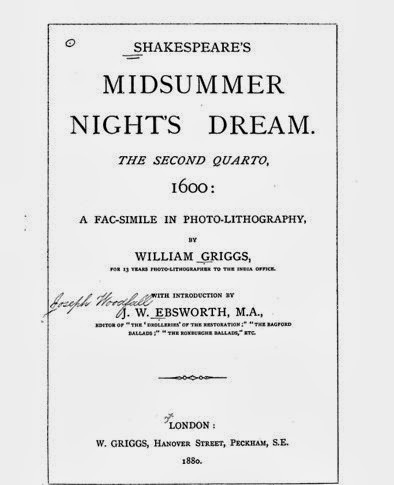 In 1880, Ebsworth wrote the Introduction to the William Griggs facsimile edition of Shakespeare's Midsummer Night's Dream and dedicated the work to his friend, J. O. Halliwell-Phillipps. On Feb. 28, 1907, Ebsworth put his library up for auction with the London auction house, Puttick & Simpson. He was disappointed in the sale: 559 lots sold for a measly sum of £521 8s 6d. Very small edition, privately printed. Tipped in loose is an autograph letter of J. O. Written near the bottom left-hand corner of this endpaper is what could be the word "Sale," along with the number "41." I have no clue about the number but the word could refer to the auction sale. A. K. S. could have been a bookseller who acquired the book at the Puttick & Simpson auction. I researched the 1906 edition of James Clegg's International Directory of Booksellers and the list of "Principal Second-hand Booksellers in the United Kingdom Who Publish Catalogues," which is included in J. H. Slater's Book Collecting: A Guide For Amateurs, London, 1892, but did not readily identify a bookseller with the initials, A. K. S. in either book. As mentioned before, Halliwell-Phillips gave Ebsworth a copy of his book in April 1887. If this letter is the very letter mentioned in the second inscription, Halliwell-Phillipps may have given Ebsworth a copy of his book in recognition of Ebsworth's recent assistance concerning the ballad. 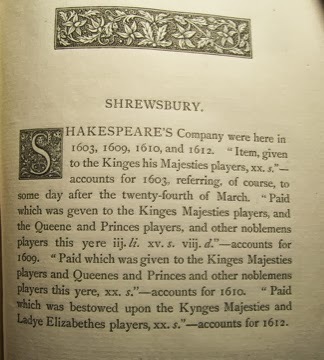 And John Collins Francis, the publisher of The Athenaeum, may have been the next owner of Ebsworth's copy of The Visits of Shakespeare's Company of Actors to the Provincial Cities and Towns of England. There are, however, no marks of provenance in the book identifying him as one of the owners. As stated in Notes by the Way, published after Ebsworth's death, Francis was already in possession of the March 28, 1887 letter. 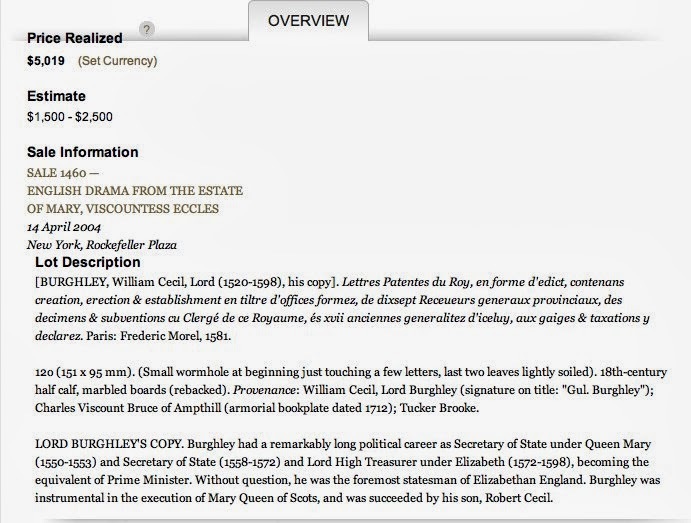 Later in Notes by the Way Francis states he was in possession of Ebsworth's manuscripts. The manuscripts were not included in the 1907 auction of Ebsworth's library. And, while it is possible that Ebsworth did not insert this particular letter into his copy of The Visits of Shakespeare's Company of Actors to the Provincial Cities and Towns of England, he normally inserted autograph letters into presentation copies of books. Book-Prices Current, Vol XXI contains an abbreviated listing of 66 of the 559 lots, three of which were presentation copies from other authors. Ebsworth inserted autograph letters in all three of them. The Visits of Shakespeare's Company of Actors to the Provincial Cities and Towns of England was not identified in this abbreviated listing. 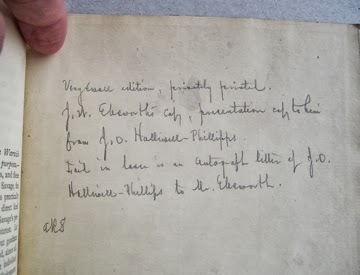 I suspect either Ebsworth withheld the book from the auction or John Collins Francis acquired both book and autograph letter from "A.K.S., the unidentified bookseller. There are no "what if's" about the identity of the next owner of the Ebsworth copy of The Visits of Shakespeare's Company of Actors to the Provincial Cities and Towns of England. He is the Shakespeare actor, Edward Hugh Sothern (1859-1933). There is, however, a question of when he acquired the Ebsworth's copy of this book. E.H. Sothern, as he was known, was the leading Shakespeare actor of his time. Sothern arrived in London on April 3, 1907, shortly after the sale of Ebsworth's library (Feb. 28, 1907). 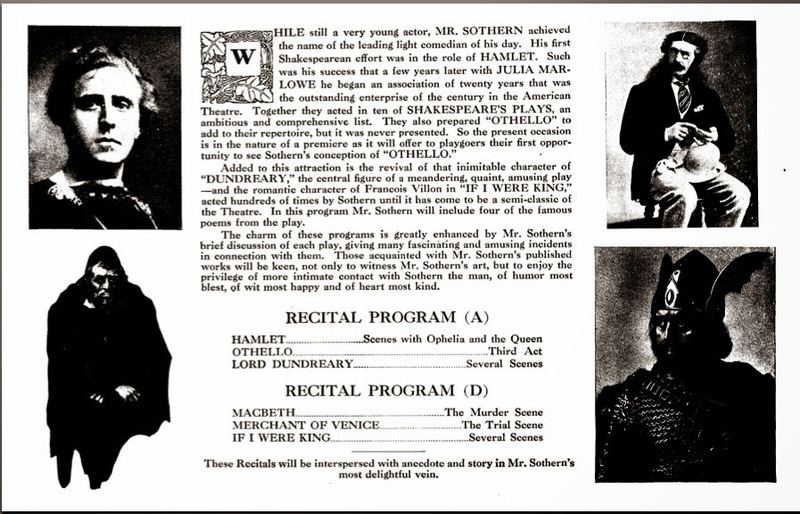 Sothern was co-starring with the actress, Julia Marlowe (1865-1950), in a series of plays to be performed in England beginning April 15, 1907. 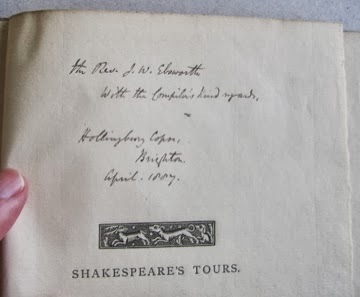 But E. H. Sothern may not have acquired Ebsworth's copy of The Visits of Shakespeare's Company of Actors to the Provincial Cities and Towns of England during this tour in 1907. 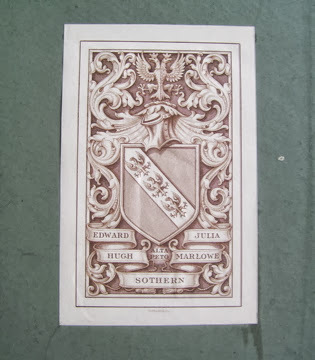 He married Julia Marlowe in London on Aug 16, 1911, which would have been the earliest date he could have pasted their bookplate on the front pastedown of the book. And if John Collins Francis was an unrecorded owner, Sothern may not have acquired the Ebsworth's copy of this book until after Francis's death in 1916. E. H. Sothern continued to play Romeo and Hamlet and all the other leading male roles, while his wife Julia played Juliet and all the other leading female roles until she retired in 1924 due to poor health. 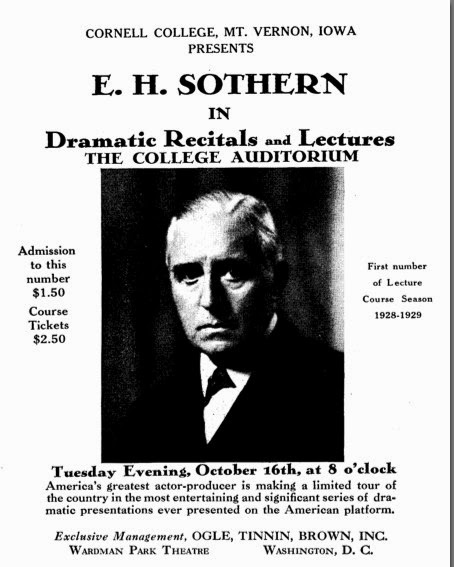 After E.H. Sothern's acting career waned, he gave dramatic recitals and lectures until his death in October 1933. 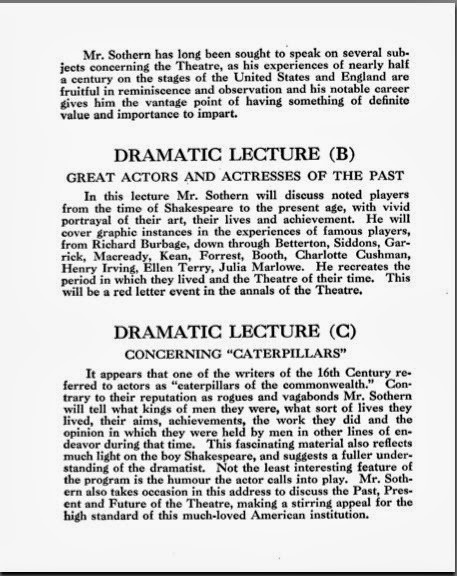 During one of these lectures, it is possible that E.H. Sothern may have crossed paths with the next owner of the Ebsworth-Sothern copy of The Visits of Shakespeare's Company of Actors to the Provincial Cities and Towns of England: C. F. Tucker Brooke (1883-1946). 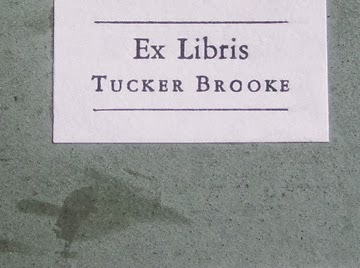 Tucker Brooke, as he was known, pasted his Ex Libris bookplate near the top of the front free endpaper of the book. Tucker Brooke was one of the first students to be awarded a Rhodes Scholarship. In fact, all three recorded owners were in England at the same time in April, 1907: J. W. Ebsworth in Ashworth, E. H. Sothern in London, and Tucker Brooke in Oxford. Tucker Brooke was the Shakespeare authority of his time, teaching at Yale from 1909 until 1946. He published numerous books about Shakespeare and several about Christopher Marlowe. Brooke was the founder and one of the editors of the Yale Shakespeare series. Although he did not believe in the authorship theory that Christopher Marlowe was Shakespeare, he firmly believed that Marlowe was the original author of the second and third parts of King Henry VI. I am most familiar with the next owner of the Ebsworth-Sothern-Brooke copy of The Visits of Shakespeare's Company of Actors to the Provincial Cities and Towns of England, having written two blog posts about her and her books: "Mary Hyde and the Unending Pursuit" in 2008 and "A Virtual Tour of My Mary Hyde Collection"in 2012. Her toad bookplate is pasted on the front free endpaper of this book below the bookplate of Tucker Brooke. Despite the influence of the Newton Sale, I continued to collect Elizabethan quartos, several of the plays that I had treated in my book of the 1600-1605 productions, including one star, the 1611 Hamlet. I also could not resist, though I did not know exactly where to put it, Professor Tucker Brooke's working library of some four thousand volumes! The Newton Sale referred to is the Parke-Bernet Galleries auction of the A. Edward Newton Collection of Books and Manuscripts conducted in April, May, and October of 1941. Newton had a Samuel Johnson Collection second only to that of R. B. Adam. And the Hydes significantly improved their own Samuel Johnson Collection with their purchases from the Newton Sale. 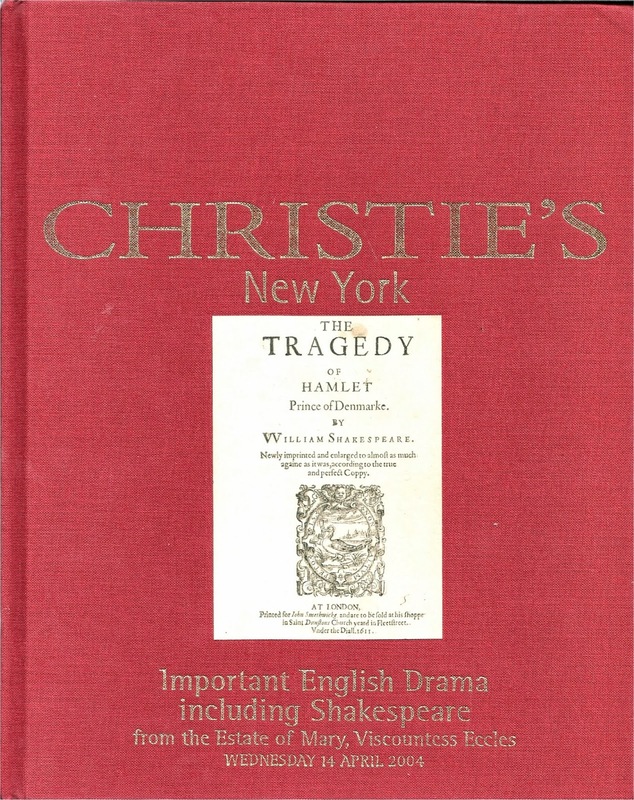 The book of 1600-1605 productions Mary Hyde refers to is an expansion of the thesis for her doctorate awarded by Columbia University in 1947, Playwriting for Elizabethans 1600-1605, first published by Columbia University in 1949, and reprinted by Octagon Books in New York in 1973. While researching for her doctorate, Mary Hyde had access to the Shakespeare and Elizabethan quartos belonging to A. S. W. Rosenbach and Carl H. Pforzheimer. And with Rosenbach's help, she assembled "a small but significant collection of Shakespeare and Elizabethan quartos, including the 1611 Hamlet. This collection was later sold at Christie's in 2004 with prices realized of $1,867,092; the 1611 Hamlet was not sold at the auction, but was sold to a private party afterwards. Interestingly, one of the books sold at the Christie's auction, lot #84, was formerly owned by Edward Hugh Sothern and Julia Marlowe Sothern, albeit in better condition than Visits of Shakespeare's Company of Actors to the Provincial Cities and Towns of England. And there was one very rare book formerly owned by Tucker Brooke in lot #5, Lord Burghley's provenance adding to its value. Mary Hyde purchased Tucker Brooke's library en bloc shortly after his death in June 1946. At the time, the gun room served as the library at Four Oaks Farm, and it was filled with their ever-growing Samuel Johnson Collection. But in "The Guest Book" chapter of Four Oaks Farm, privately printed in Somerville, New Jersey in 1967, Mary Hyde reveals that George Knapp, the award-winning gardener of Four Oaks Farm, also had carpentry skills, and built bookshelves to house the Tucker Brooke Collection in the attic. The room then became known as the Tucker Brooke Library. The term "working library" best describes the Tucker Brooke Library, most of the books being "scholarly works" rather than "collectibles." 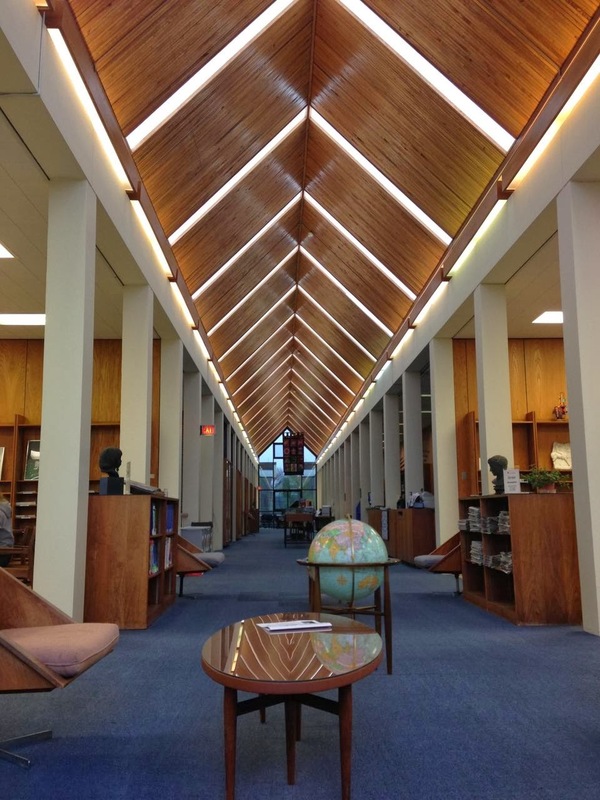 In fact, the Tucker Brooke Collection is not identified in the Four Oaks Farm companion book, Four Oaks Library, as one of the collections in the Four Oaks Library. 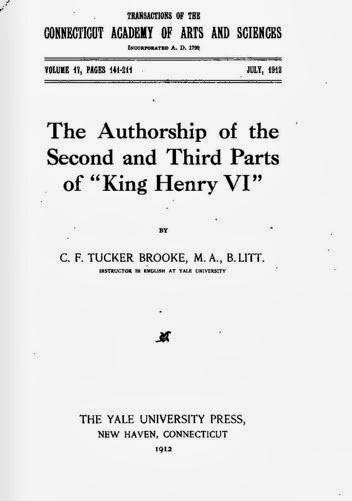 The acquisition and disposition of the Tucker Brooke Collection evidently were not considered to be significant events because they were not identified in "Mary Hyde Eccles: A Chronology," located in the preliminary pages of Mary Hyde Eccles: A Miscellany of Her Essays and Addresses, published by the Grolier Club in 2002. There is, however, a folder (#2505) in the Mary Hyde Eccles Papers shelved off-site at the Harvard Depository and dated December 1969 which contains photographs of "the moving of the Tucker Brooke Library." I believe this is when Mary Hyde donated a substantial portion of the Tucker Brooke Collection to a library named after a very dear friend of hers: Arthur Houghton (1906-1990). But if you're thinking the Houghton Library at Harvard University, you are wrong! I'm referring to "the other Houghton Library," the Arthur A. Houghton, Jr. Library, Corning Community College, in Corning, New York. The Gift Bookplate of the Arthur A. Houghton, Jr. Library is pasted on the verso of the front free endpaper. Note: 1957 is the year the College was created, and not when the gift was received. The Hydes first met Arthur Houghton in November 1940 shortly after their arrival in New York from Detroit. At the time, Houghton, a rare book collector himself, was Curator of the Rare Book Collection of the Library of Congress. Arthur Houghton was President of the Shakespeare Association of America from 1949 to 1956, and remained on the Advisory Board while Mary Hyde was President in the early 1960s. Arthur Houghton, an executive with Corning Glass Works and its subsidiary, Steuben Glass, actually had two libraries named after him. A graduate of the Harvard Class of 1929, Houghton paid for the construction of a library at Harvard to house its rare book collections and manuscripts in a separate building. The Houghton Library at Harvard opened in 1942. In 1960, Arthur Houghton and Corning Glass Ware donated 273 acres of land and $2,225,000 for the construction of a Spencer Hill campus for Corning Community College. And the library named after him, the Arthur A. Houghton, Jr. Library, opened in May, 1964. The gift of the Tucker Brooke Collection to the Arthur A. Houghton Library appears to have been conducted without fanfare or publicity. The books were gradually absorbed into the library stacks. There are dates ranging from 11-05-70 to 10-19-72 written in the gutter of the page after the title page in the books I acquired from the library. I suspect these are the dates the books from the Tucker Hyde Collection were absorbed into the library. The Ebsworth/Sothern/Brooke/Hyde copy of Visits of Shakespeare's Company of Actors to the Provincial Cities and Towns of England was absorbed into the Houghton Library on 8-27-71. And so I gladly add this ex-lib book with all its markings, and all its splendid history of ownership to My Sentimental Library Collection. This is a fine piece of bibliosleuthing and I was much enjoyed by my close reading of it. I thank you.